Although whisky barrel stave frames lend themselves well to panoramic photographs they can also be used to frame other forms of artwork. 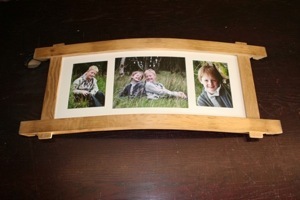 We offer an additional service to customers who wish to own a whisky barrel frame containing their own photos or artwork. There are two types of multi-apertures available - those where mounts are cut to suit the artwork as in examples 1, 2 and 3 and those with oak dividers made to frame standard 7” x 5” photographs as in examples 4 and 5. Because of the diversity and varying length of whisky barrel staves a range of options is available. If you are interested in this service please contact us or email your photographs and we will advise on suitability and cost.